What if it rained food from the sky? One of my favorite classes in college was Children’s Literature. It took a lot of time reading picture and chapter books, but it brought back a lot of childhood memories. 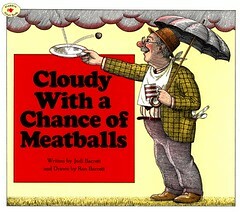 One memory was when I was in elementary school and heard the book Cloudy with a Chance of Meatballs by Judi Barrett for the first time. There was just something special about the story and characters thanks to the amazing illustrations by Ron Barrett. I recall dreams of being swept into the world of Chewandswallow where the days meals rained down from the sky onto the land below. How neat it would be to have food prepared for you without cooking. I can not wait to see this book come to life in the movies this fall. Reading books with my boys allows all of our imaginations to run wild. In the upcoming weeks, I plan on reading some new books with NHL. I want to hear what he thinks and learns from the books. Hopefully this will be a fun experience that I can share with everyone and NHL will remember for years to come. If you lived in the town of Chewandswallow, what would you like to rain from the sky to eat and why? « Where is the adult-parent line? I LOVE this book also and I JUST found out today that there was going to be a movie… CAN’T WAIT!!!! Ideally, I would like a little diet pepsi rain and some baked ziti. Although, I would certainly settle for chicken enchiladas as well- lol. graceful girl’s last blog post..Aloha! Sarah Berry’s last blog post..Aloha Friday! i love this book too. i didn’t know it was coming out as a movie. how fun that will be!!! hmmm….i think i’d wish for chocolate chips. phyllis’s last blog post..Throwing a Party with Rocky Road Bars! It can rain anything as long as I don’t have to cook. What a fun sounding book!!! I will have to find that at the library and read it to my boys. i forgot all about this book! i’m going to have it pick up a copy for my son. right about now, i could go for some chocolate covered pretzels instead of the snowflakes we’re having fall from the sky this morning! Smores! I love them, they take time to make. But to have them fall and be at the ready – heaven! 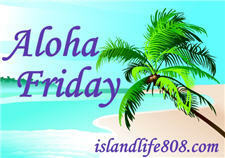 Julie@Cool Mom Guide’s last blog post..Aloha Friday-#1! Choclate – you can never have enough chocolate! That’s one of my favorite childhood books! I would love it if it rained chocolate–I would never go back inside! Shari @ a Psych Mommy’s last blog post..TC and Co Winner! I wish it would rain chocolate covered strawberries. kimberly h’s last blog post..Aloha Friday!!! I don’t think I’ve read that book. Sounds fun. I think right now, I’d take jelly beans raining from the sky … Jelly Belly brand. I’m sure I’ll get my fill of jelly beans for the year, though, by the time Easter rolls around! It has been a really busy couple of days so I am just now getting a chance to read my favorite blogs. However, before I even answer you question I just want to say that I absolutely love this book. Have you read Pickles to Pittsburgh too?